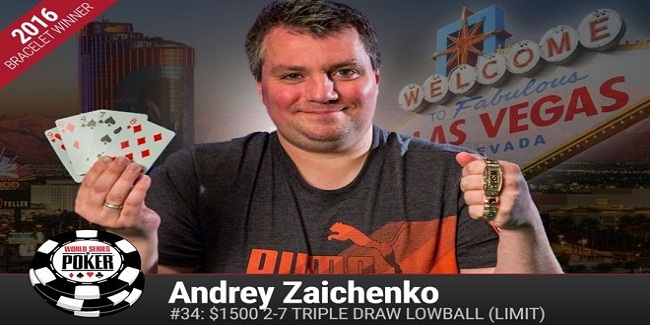 A professional poker player from Moscow, Russia named Andrey Ziachenko won the event#34 of the world series of poker 2016. It was a $1,500 buy in Limit Deuce to seven Triple draw event to which the Russian did great and collected the first prize of amount $117,947, being first along with the gold bracelet. The event attracted 358 players and generated a top pool prize of amount $483,300. Best 54 places of the event got payouts. Jameson Painter of Las Vegas was the runner up of the game and finished his journey by collecting an amount of $72,878.This was the 32nd cash for the winner at WSOP. He has been through 5 final tables and got one gold bracelet. Total WSOP earning for the player is now $1,160,546. After winning the first ever gold bracelet Ziachenko said that I have been playing Limit Hold’em a lot, since last three years, I love to play Limit Cash games in Russia and that paid off today. I am very happy, that I did this, “The bracelet is the goal which I wanted, he added. Ziachenko is the 11th player of Russia, who has won a gold bracelet playing at world series of poker. Andrey Ziachenko took home $117,947, being first in the game at Rio, In Las Vegas, Jameson Painter from Vegas was the second position holder ($72,878), whereas Guy Hareuveni of Israel collected $46,992, being third. Another Russian Alexsandr Vinskii was at fourth for $31,099, Adam Spiegelberg, from Las Vegas was at fifth for $21,139, whereas Andril Nadieliaiev, from the Ukraine collected $14,769, being sixth. 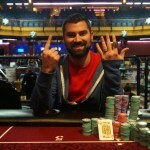 Andrew “A.J.” Kelsall of Tampa got eliminated to seventh place and got a share of amount $10,614, meanwhile Daniel Zack hit the rail to eighth position and added an amount $10,614 to his main account.